Deep Learning isn't a recent discovery. The seeds were sown back in the 1950s when the first artificial neural network was created. Since then, progress has been rapid, with the structure of the neuron being "re-invented" artificially. Computers and mobiles have now become powerful enough to identify objects from images. Not just images, they can chat with you as well! Haven't you tried Google's Allo app ? That's not all—they can drive, make supersonic calculations, and help businesses solve the most complicated problems (more users, revenue, etc). But, what is driving all these inventions? It's Deep Learning! With increasing open source contributions, R language now provides a fantastic interface for building predictive models based on neural networks and deep learning. However, learning to build models isn't enough. You ought to understand the interesting story behind them. In this tutorial, I'll start with the basics of neural networks and deep learning (from scratch). Along with theory, we'll also learn to build deep learning models in R using MXNet and H2O package. Also, we'll learn to tune parameters of a deep learning model for better model performance. Note: This article is meant for beginners and expects no prior understanding of deep learning (or neural networks). 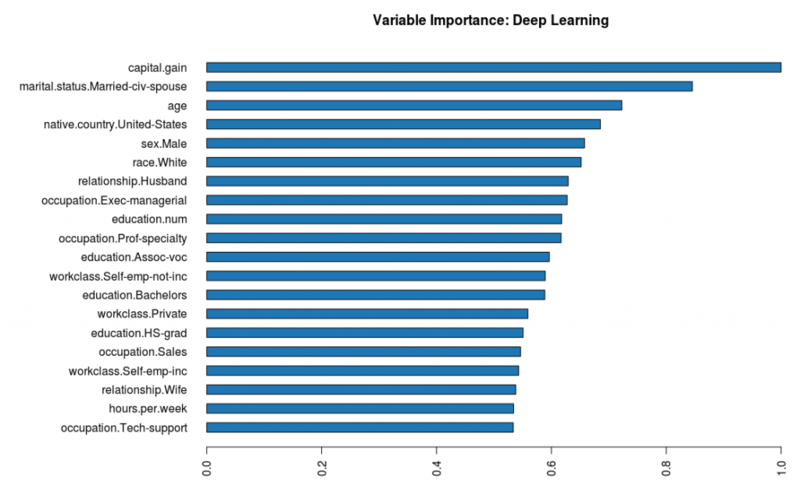 What is Deep Learning ? How is it different from a Neural Network? Why is bias added to the network ? 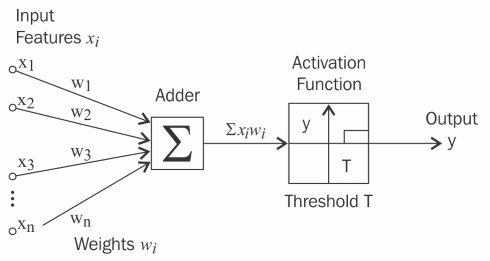 What are activation functions and their types ? What is Backpropagation Algorithm ? How does it work ? Deep Learning is the new name for multilayered neural networks. You can say, deep learning is an enhanced and powerful form of a neural network. The difference between the two is subtle. 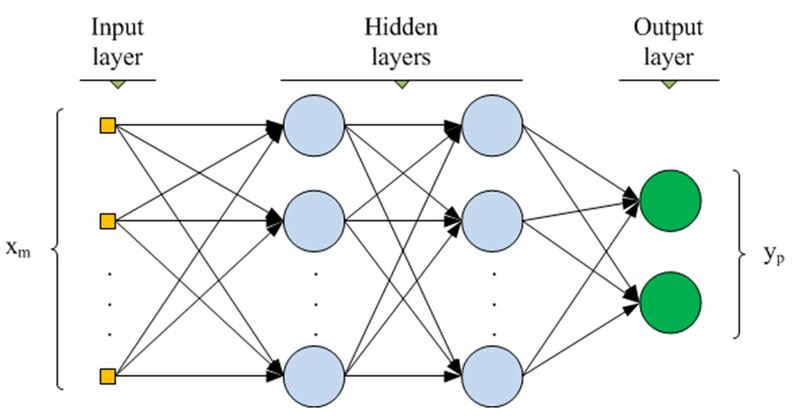 The difference lies in the fact that, deep learning models are build on several hidden layers (say, more than 2) as compared to a neural network (built on up to 2 layers). Since data comes in many forms (tables, images, sound, web etc), it becomes extremely difficult for linear methods to learn and detect the non - linearity in the data. In fact, many a times even non-linear algorithms such as tree based (GBM, decision tree) fails to learn from data. In such cases, a multi layered neural network which creates non - linear interactions among the features (i.e. goes deep into features) gives a better solution. You might ask this question, 'Neural networks emerged in 1950s. But, deep learning emerged just few years back. What happened all of a sudden in last few years?' In the last few years, there has been tremendous advancement in computational devices (specially GPUs). High performance of deep learning models come with a cost i.e. computation. They require large memory for computation. The world is continually progressing from CPU to GPU (Graphics Processing Unit). Why ? Because, a CPU can be enabled with max. 22 cores, but a GPU can contain thousands of cores, thereby making it exponentially powerful than a CPU. Yes, you have it too. And, not just one, but billions. We have billions of neurons and trillions of synapses (electric signals) which pass through them. Watch this short video (~2mins) to understand your brain better. The dendrites receive the input signal (message). These dendrites apply a weight to the input signal. Think of weight as "importance factor" i.e. higher the weight, higher the importance of signal. The soma (cell body) acts on the input signal and does the necessary computation (decision making). Then, the signal passes through the axon via a threshold function. This function decides whether the signal needs to be passed further. If the input signal exceeds the threshold, the signal gets fired though the axon to terminals to other neuron. where wo = bias, wi = weights, xi = input variables. The function g() is the activation function. In this case, the activation function works like this: if the weighted sum of input variables exceeds a certain threshold, it will output 1, else 0. This simple neuron model is also known as McCulloch-Pitts model or Perceptron. In simple words, a perceptron takes several input variables and returns a binary output. Why binary output ? Because, it uses a sigmoid function as the activation function (explained below). If you remove the activation function, what you get is a simple regression model. After adding the sigmoid activation function, it performs the same task as logistic regression. However, perceptron isn't powerful enough to work on linearly inseparable data. Due to its limitations, Multilayer Perceptron (MLP) came into existence. If the perceptron is one neuron, think of MLP as a complete brain which comprises several neurons. Why is bias added in the neural network ? 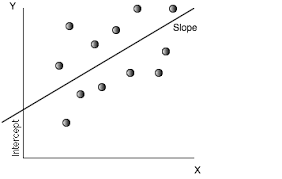 Bias (wo) is similar to the intercept term in linear regression. It helps improve the accuracy of prediction by shifting the decision boundary along Y axis. For example, in the image shown below, had the slope emerged from the origin, the error would have been higher than the error after adding the intercept to the slope. Similarly, in a neural network, the bias helps in shifting the decision boundary to achieve better predictions. The perceptron classifies instances by processing a linear combination of input variables through the activation function. We also learned above that the perceptron algorithm returns binary output by using a sigmoid function (shown below). A sigmoid function (or logistic neuron ) is used in logistic regression. This function caps the max and min values at 1 and 0 such that any large positive number becomes 1 and large negative number becomes 0. It is used in neural networks because it has nice mathematical properties (derivative is easier to compute), which help calculate gradient in the backpropagation method (explained below). In general, activation functions govern the type of decision boundary to produce given a non-linear combination of input variables. Also, due to their mathematical properties, activation functions play a significant role in optimizing prediction accuracy. Here is a complete list of activation functions you can find. Feedforward Neural Network: In this network, the information flows in one direction, i.e., from the input node to the output node. Recurrent (or Feedback) Neural Network: In this network, the information flows from the output neuron back to the previous layer as well. It uses the backpropagation algorithm. What is the Backpropagation Algorithm? How does it work ? The goal of the backpropagation algorithm is to optimise the weights associated with neurons so that the network can learn to predict the output more accurately. Once the predicted value is computed, it propagates back layer by layer and re-calculates weights associated with each neuron. In simple words, it tries to bring the predicted value as close to the actual value. It's quite interesting! where n = the number of observations in the data, yi = the actual value, yi cap = the predicted value. Let's call it equation 1. The constant value 1/2 is added in front for ease of computational purposes. You'll understand it in a while. This cost function is convex in nature. A convex function can be identified by a U-shaped curve (shown below). A great property of the convex function is that it is guaranteed to provide the lowest value when differentiated at zero. Think of a ball rolling down the curve. It will take a few rounds of rolling (up and down) to slow down and it settles at the bottom. That bottom point is the minimum. And, that's where we want togo! where J(w) is the vector of weights. Note that we have only substituted ycap with its functional form (wjxj); the rest of the equation is same. Now, this equation is ready for differentiation. First, it calculates the partial derivative of the weight. If the derivative is positive, it decreases the weight value. If the derivative is negative, it increases the weight value. The motive is to reach to the lowest point (zero) in the convex curve where the derivative is minimum. It progresses iteratively using a step size (η), which is defined by the user. But make sure that the step size isn't too large or too small. 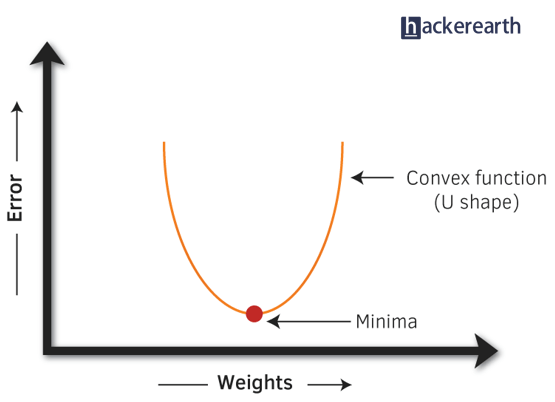 Too small a step size will take longer to converge, too large a step size will never reach an optimum. Let's run a recurrent neural network model on this data with 2 input neurons and an output neuron. The activation function is a sigmoid function. If you understand this, calculations with hidden neurons are similar. Output from one layer becomes input for the hidden layers. Again, the algorithm will recompute the weights for Iteration 2 and so on. Practically, this iteration goes on until the user defined stopping criteria is reached or the algorithm converges. Since the algorithm finds weights for every row in the data, what if your data set has 10 million rows ? You are lucky if you have a powerful computational machine. But for the unlucky ones ? Don't get upset, you can use the stochastic gradient descent algorithm. The only difference between gradient descent and stochastic gradient descent (SGD) is that SGD takes one observation (or a batch) at a time instead of all the observations. It assumes that the gradient for a cost function computed for a particular row of observations will be approximately equal to the gradient computed across all rows. It updates parameters (bias and weights) for each training example. Also, SGD is being widely using in online learning algorithms. Until here, we focused on the conceptual part of deep learning. Now, we'll get some hands-on experience in building deep learning models. R offers a fantastic bouquet of packages for deep learning. Here, we'll look at two of the most powerful packages built for this purpose. For this tutorial, I've used the adult data set from the UC Irivine ML repository. Let's start with H2O. This data set isn't the most ideal one to work with in neural networks. However, the motive of this hands-on section is to make you familiar with model-building processes. hidden - It specifies the number of hidden layers and number of neurons in each layer in the architechture. epochs - It specifies the number of iterations to be done on the data set. rate - It specifies the learning rate. activation - It specifies the type of activation function to use. In h2o, the major activation functions are Tanh, Rectifier, and Maxout. Now, let's build a simple deep learning model. Generally, computing variable importance from a trained deep learning model is quite pain staking. But, h2o package provides an effortless function to compute variable importance from a deep learning model. Now, let's train a deep learning model with one hidden layer comprising five neurons. This time instead of checking the cross-validation accuracy, we'll validate the model on test data. For hyperparameter tuning, we'll perform a random grid search over all parameters and choose the model which returns highest accuracy. The mxnet package provides an incredible interface to build feedforward NN, recurrent NN and convolutional neural networks (CNNs). CNNs are being widely used in detecting objects from images. The team that created xgboost also created this package. Currently, mxnet is being popularly used in kaggle competitions for image classification problems. This package can be easily connected with GPUs as well. The process of building model architecture is quite intuitive. It gives greater control to configure the neural network manually. Let's get some hands-on experience using this package. Follow the commands below to install this package in your respective OS. For Windows and Linux users, installation commands are given below. For Mac users, here's the installation procedure. Now, we'll train the multilayered perceptron model using the mx.mlp function. Softmax function is used for binary and multi-classification problems. Alternatively, you can also manually craft the model structure. Similarly, we can configure a more complex network fed with hidden layers. Understand it carefully: After feeding the input through data, the first hidden layer consists of 10 neurons. The output of each neuron passes through a relu (rectified linear) activation function. We have used it in place of sigmoid. relu converges faster than a sigmoid function. You can read more about relu here. Then, the output is fed into the second layer which is the output layer. Since our target variable has two classes, we've chosen num_hidden as 2 in the second layer. Finally, the output from second layer is made to pass though softmax output function. The predicted matrix returns two rows and 16281 columns, each column carrying probability. Using the max.col function, we can extract the maximum value from each row. If you check the model's accuracy, you'll find that this network performs terribly on this data. In fact, it gives no better result than the train accuracy! On this data set, xgboost tuning gave 87% accuracy. If you are familiar with the model building process, I'd suggest you to try working on the popular MNIST data set. You can find tons of tutorials on this data to get you going! Deep Learning is getting increasingly popular in solving most complex problems such as image recognition, natural language processing, etc. If you are aspiring for a career in machine learning, this is the best time for you to get into this subject. The motive of this article was to introduce you to the fundamental concepts of deep learning. In this article, we learned about the basics of deep learning (perceptrons, neural networks, and multilayered neural networks). We learned deep learning as a technique is composed of several algorithms such as backpropagration and gradient descent to optimize the networks. In the end, we gained some hands-on experience in developing deep learning models. Do let me know if you have any feedback, suggestions, or thoughts on this article in the comments below!